Search engine DuckDuckGo published the findings of an experiment that it conducted earlier this year on the company's Spread Privacy website. The company wanted to to determine whether Google Search, the world's largest search engine, applied filter bubbles to signed out users as well. Filter bubble refers to displaying results to searchers based on information known about them. Information may include the location, device and software, previous searches, activity, or purchases. Filter bubbles put searches in an echo chamber as it delivers results to them that they may look more favorable upon. Apart from making it very easy to manipulate searchers, it is also detrimental when it comes to the forming of an opinion about a particular subject. DuckDuckGo asked participants of the experiment to conduct a series of searches at the same time and sequence, logged out, in private browsing mode and in normal (logged out) browsing mode, from the United States. 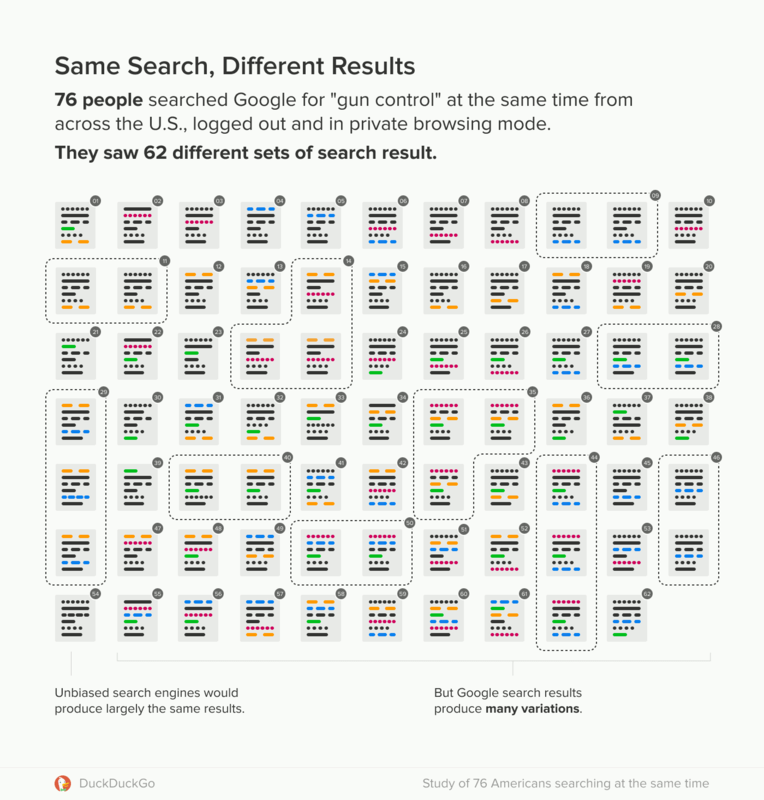 Participants were asked to search for "gun control", "immigration", and "vaccinations" on Google Search in the United States. Most participants saw unique results. The layout of results was often different, e.g. with news modules or video results. People were shown different news and video sources. Private browsing mode does not appear to reduce the filter bubble by a lot, if at all. Unique results were displayed for 68%, 57% and 92% of all participants in private browsing mode, and for 59%, 63% and 92% in normal browsing mode. One could argue that the variation was caused by a searcher's location in the United States. DuckDuckGo accounted for time and location of the search. For time, by letting all participants search at the same time, and for location, by grouping all local results together as a single Local Source result. The researchers discovered that Private Browsing Mode and being logged out does not reduce the filter bubble significantly. An average of 3 domain changes were detected when two random private mode results were compared. The study suggests that Google Search displays a different set of results to users which makes it more difficult for searchers to form educated opinions about a subject and opens the door for manipulation. In other words: the Google filter bubble is real, even for signed out users and incognito users. The study was conducted by just 87 participants in the United States. That's a low number and it is possible that results would be different if thousands of users were to run searches at the same time. Apart from that, there is still the possibility that Google is testing results heavily by pushing different sets of results and features to users. The company may use location, e.g. the city or region, browser, platform, and other factors to provide results. One example: the different news sources displayed to users could be based on a list of preferred news sources by region. Back in 2011, Eli Pariser held a TED Talk in which he stated that Google was using 57 different signals alone for users not signed in to Google. These signals play a part in delivering results to users and may explain the differences at least partially. It would have been interesting if the participants would have weighted individual results to determine whether Google's algorithm picks results that have the highest chance of being the most favorable to the searcher. Privacy-focused search engines like Startpage or DuckDuckGo promise that they don't use filter bubbles. Check out these tips, this and these, for Startpage search. Now You: What is your take on the study? Which search engine do you use primarily? I am using the Engine QWant since more than a year for about 95% of my searches, made in Europe, located in France, partly European Investors, among them Axel Springer… it remains to be seen what is or will be with the Filter Bubble from this side. Axel Springer certainly doesn’t inspire confidence! Not terribly surprising. If your device’s IP is transmitted, Google can tie it to your account, signed in or not. Account tie ins give Google more info but not much if your browsing is stored elsewhere anyway. Not a fan of google’s ravenous data collection, manipulation, etc., but they need at least some user information to provide results. Logged out or in or private mode shouldn’t give much different results if your user IP and searches are stored by Google or your ISP generously provides them. I’ve tried something similar simultaneously with my laptop and phone and results are different! Phone Me apparently thinks differently than Laptop Me according to google. That makes some sense; I do different things with each device and don’t use the phone much at all. In theory, using users’ histories to deliver personalized results is a good thing but Google is an ad company, searching just hooks you long enough to connect layers of other companies to your session, which typically turns browsing to crap after a period of time. Actually, Google doesn’t need any of your information to provide a search result. They collect it to sell to advertisers, which is the primary source of revenue. The quality and accuracy of Google searches has degraded substantially from a decade ago. It sure has. I used to be a professional web developer, and my forte was guaranteeing a Google Search Number 1 ranking for my clients primary search term. Over the years, I noticed that Google randomly “changed their algorithm”, consistently producing poorer and poorer results. But the reason Google changed their algorithm was simply to knock the Number 1’s off the top 10, and force them into buying Google Ads. The former Number 1’s didn’t have to advertise, you see, and they got most of the business for their search term. Google let’s them ride at Number 1 for a couple of years, building business, buying equipment, adding employees and borrowing to buy homes, educations for their kids, etc. Then WHAM – no ranking and the phones totally stop ringing. No business. No cash flow. Panic sets in and they BUY GOOGLE ADS to survive. The ad revenue goes up for Google, which raises the STOCK VALUE, making the shareholders richer and richer, while slowly ruining the search results. Google is as corrupt as the Clinton Foundation. Google sold its soul to build a censoring engine for Chine, one which reports live location data to the police for any person searching for one of those censored topics, like “freedom”, or “liberty” or “human rights”. Google is the most dangerous corporation on earth, and should be burned to the ground. Given that google search forces the use of https, surely “your ISP” is blind to the content of your search queries/results. An IP address as a unique identifier. Unless having ever been banned or something, so many users forget that. Not company or website owners though. Pretty much the most important topic completely forgotten related to privacy. True to an extent, but unless you have a dedicated IP address, your IP address can change to a new one and your old one gets assigned to someone else. There are also circumstances where multiple people share the same internet-visible IP address. These issues mean that an IP address is not actually very good for determining identity or even continuity. That’s why many courts don’t accept IP addresses all by themselves as being proof that a particular person did a particular thing. Google, like Facebook, is tracking everyone logged on not logged by building a shadow copy (like Facebook) and installing traces on users devices. I use a Google container app w/FF. I am left wondering if the app actually limits my exposure to Google. As I understand it, it limits your exposure in a very narrow sense. If you’re using Google in a container, that means that the tab you’re using Google in can’t read the data related to other tabs. It does not, however, limit anything else Google wants to collect. I’m still not sure what, precisely, containers actually do, so I’m just going by the high level explanations Mozilla has provided. You understand that the “private” in “private browsing” does not refer to privacy in relation to the sites you’re going to, right? It means private in terms of exposure to others who many use the same machine as you. Private browsing only prevents any traces of browsed sites from being saved on your computer, not on Google’s servers. This is the base of the base. Ideally a website should be concerned by a user’s data only when the user is on that site and logged in. We are now facing Level 4 with Google, facebook, Twitter, Amazon, not to mention CDNs and CloudFlare to start with. Cross-sites transfer of users’ data is of course the practice. There’s no total privacy possible on the Web except for highly skilled geeks, but we can do our best to make ’em trackers sweat as much as possible. I have no Google account, Google cookies blocked, a myriad of filters and yet I’m tracked by the company. Of course I block any Google servers which are not indispensable for sites’ pages correctly rendered but I really believe that sites administrators should stop calling Google services for this and for that, for fonts, scripts, maps … as they should stop using CDNs for anything else then heavy stuff (audio, video). There are some sites, nice and clean, no calls to external servers, displayed instantly, which have at home their scripts and fonts, which may need maps and then call OpenStreetMap rather than Google Maps, which keep heavy data if applicable on clean CDNs rather than on centralized-information-together-with-data-hosting CDNs. But less and less..
No Google account as I said and Google search avoided as much as possible (occasionally Google Maps/Images). DDG, Qwant, SearX and new.StartPage are the four search engines I use. @Anonymous, I know that, I have it in mind when I opt for Qwant, SearX or new.Startpage instead. The idea is to diversify search engines and avoid Google. Even your own ISP is spying you and injecting ads to webpage nowadays. Can you really trust DDG, StartPage, your VPN, etc don’t sell your data behind your back? No offense. If someone is so conscious of privacy, they should leave internet. @Anonymous, not all ISPs inject adds but all do know of course all of their users’ destinations even if encrypted DNS limits the gathered information. The problematic is not in trusting or not but rather in diversifying sources, each of theses sources not being themselves already exaggeratedly fed and each of theses sources less likely to exchange information with each other than the big fat ones : Qwant and SearX are less tied than Microsoft (Bing) and Google for instance. As I wrote above total privacy on the Net is a dream for most of us. But I also believe that life offers more options than take or leave which would mean that being aware of privacy on the Web deosn’t lead to the only option of leaving it. I think we have to keep up with our convictions and principles independently of their efficiency, total or not, and if we all do rather than surrendering (“pragmatism”, “real-web-politik”) then we could be surprised by medium/long term benefits. That doesn’t surprise me. I’ve found that the quality of Google search results has declined significantly for me, and I’ve strongly suspected that this was because Google was trying to “personalize” my search results even though I wasn’t logged in. I switched to AzireVPN a short while ago and if I use Google it gives me all the results in Swedish even when logging in to Azire’s UK server. I don’t like DDG primarily because they use pale grey fonts to display search results which gives me a headache after just a few searches. The FF addon I use to turn the font black doesn’t work on their site and I’ve switched to using Startpage now where it does. But SP has it downsides in that prefs are on a separate page and have to be saved to a cookie in order to work. But I’ve set Waterfox to clear those on exit. I thought that adding an exception for SP would help, but it doesn’t. DDG has options to search using filters on the main page and it’s a pity that SP doesn’t have that option. But at least the search results are in English. Goog has demolished its search engine. Remember the golden age of search, circa 2006 when searching for obscure info on a wide range of topics revealed excellent results. Its been replaced with political opinions, fake news and useless opinions. True knowledge has been decimated for the most part. Need an example? When you think of Americas greatest inventors, what comes to your mind? Censorship and Google go hand in hand now – not just their controversial Chinese search engine. Shadow banning and silencing opinions they do not agree with is common place now – particularly when these opinions are neither political / religious / racist or inciting hatred of any kind. Merely having an opinion that is different from theirs is sufficient. With algorithms that sort by “popular” try asking yourself how “popular” is defined and put forward. “Popular” according to Google? Try changing the filter to “newest” and remarkably you will see a different set of results – all of them including missing “shadow banned” results. Clearly their “popular” algorithm is biased. 2.) Trust is for naive people with an underdeveloped brain! 3.) If your daily live and activities rely strongly on others’ behavior, do not use the internet. Sorry for being blunt, but this is the way I see it. Nobody is 100% trustworthy about everything, period. However, everyone is trustworthy about some things. I trust somebody when I feel I have a good handle on what they can be trusted about, and what they can’t. Also, “trust” is different than “blind trust”. Being blind is never a good thing, be it about trust or anything else. It is a metasearch engine, one of the best for me. Alternatively Qwant lite, often just a bit better results, but seeing where it is coming from I do not trust it very much, only when searx.me does not give desired results. Smells too much to the Wir schaffen das desillusionists in Europe. Duckduckgo is not my first choice, since it uses Amazon’s servers. Startpage I have my doubts. Why would Google allow this? I tried to switch to DuckDuckGo, but responses were relevant but general and vague. Google’s responses have deteriorated to irrelevant, popular, useless (usually not logged in, but I use gmail every day). I’m going to try some of the resources mentioned above. hmmm, posters here talk about ads. i dont get any ads….havent for some years now. there might be the rare informational pop up but not any ads. whatever site i go to just does not show any ads. only use ublock origin with older version of palemoon, sandboxed. Of course they are filtering based on region. I use google exclusively for image search and just by swapping the search region in settings it alters the results dramatically, and I am never use accounts.